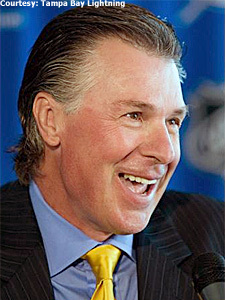 Barry Melrose was named the new head coach of the Tampa Bay Lightning today. After drafting top prospect Steven Stamkos on Friday and introducing an eight-man ownership group Monday, the Tampa Bay Lightning completed the trifecta Tuesday when Barry Melrose was hired as the sixth coach in franchise history. The hiring caps a busy week for the Lightning, whose new ownership group, led by Hollywood producer Oren Koules and former player turned real estate developer Len Barrie, long had their sights set on Melrose behind the bench. Koules and Barrie, who stated the club also will be an active participant in the free-agent market (which starts July 1), announced Melrose's appointment at a news conference Tuesday morning. "We are very pleased that Barry signed on to become the next head coach of the Tampa Bay Lightning," Barrie and Koules said in a joint statement. "We believe Barry offers just what this team needs and it starts with his ability to get all 20 players pushing in the same direction and playing at 100 per cent night-in, night-out. We like his enthusiasm and passion for the game and we know the fans of Tampa Bay will take a liking to him." Melrose is determined to reestablish a winning tradition in Tampa Bay, which failed to qualify for the playoffs last season after finishing with just 71 points (31-42-9), the fewest in the League. "I want to surround our team with guys who have fire and who hate to lose," said Melrose. "When we lose, this isn't going to be a fun place to be. I want guys that play hard every night, and I'm not talking about fighting or constant hitting, either. You can intimidate by speed, talent, good defense and goaltending and that's what I want out of this team. I want our fast guys and our tough guys to be intimidating." In addition to having the chance to work with Stamkos, the first pick at the 2008 NHL Entry Draft, Melrose takes over a team that returns two of the top 15 point-producers in the NHL last season in Lecavalier (92 points) and St. Louis (83). He's ecstatic to have an opportunity to return behind the bench. "I'm obviously excited to be back in coaching," he said. "I'm especially looking forward to the opportunity to work with great players such as Vinny Lecavalier, Marty St. Louis and Steven Stamkos; they're all such talented and exciting athletes. Most of all, I have missed having a dog in the fight each season, especially at the start of the Stanley Cup Playoffs." Melrose, who turns 52 on July 15, said earlier this month on ESPN's Pardon the Interruption that he missed coaching and would entertain any NHL offers. Melrose has succeeded at every level in his eight seasons as a coach. In 1988, his first season behind the bench, he led the Western Hockey League's Medicine Hat Tigers to a Memorial Cup title. In 1992, he guided the Adirondack Red Wings of the American Hockey League to a Calder Cup championship. In his first season as an NHL coach, with the Los Angeles Kings in 1992-93, he guided a Wayne Gretzky-led club to the Stanley Cup Final for the first time in franchise history, where they fell in five games to the Montreal Canadiens. Melrose coached three seasons in Los Angeles, from 1992-93 through 1994-95, compiling an 82-103-31 record. "I don't really know a lot about him (Melrose) since I was a little too young when he was coaching in Los Angeles," Stamkos told NHL.com. "I do remember when he coached (Wayne) Gretzky and led L.A. to the Stanley Cup Final after they beat the (Toronto) Maple Leafs (in the Campbell Conference Final), but other than that, I'll be looking forward to meeting him in the future." Melrose replaces John Tortorella, who was fired June 3. Tortorella guided the Lightning to four playoff appearances and the 2004 Stanley Cup in his 6½ seasons behind the bench. Phoenix Coyotes assistant Rick Tocchet and former Minnesota Wild center Wes Walz will be Melrose's assistants. "I'm excited about this staff," Melrose said. "I wanted someone who recently left the game and Wes was perfect. His background with Minnesota Wild and their defensive style is as good as any team in the NHL, so that's certainly someone I want around our group. "Tocchet is a guy who symbolizes how you should play the game. He wasn't the most skilled guy in the world, but he's still a borderline Hall of Famer because of how hard he played the game, his intensity, his work ethic and the price he paid each shift. These are the types of players I want our young guys around, role models who have been there and done it before." Melrose played 300 NHL games spread over six seasons as a defenseman with Winnipeg, Toronto and Detroit, recording 10 goals, 23 assists and 728 penalty minutes. He skated in seven Stanley Cup playoff games with the Maple Leafs, assisting on two goals and recording 38 penalty minutes. He also played three seasons with Cincinnati in the WHA (1976-79). Melrose had been working in a variety of hockey-related roles for ESPN since 1996, including contributions on SportsCenter, ESPN Radio and ESPN The Magazine. In addition to Koules and Barrie, the other members of Tampa's ownership group include Mark Burg, Koules' partner at Evolution Entertainment; advertising executive Jordan Zimmerman; orthopedic surgeon Dr. Richard C. Lehman; lawyer and investment banker Russell Belinsky; Craig Sher, executive chairman of St. Petersburg-based The Sembler Company; and Irwin Novack, who is chief executive officer of Kane's Furniture. The Lightning open the 2008-09 season with two games against the New York Rangers at Sazka Arena in Prague, Czech Republic, on Oct. 4 and 5.